The oak looked like this on the afternoon of June 22, 2016. 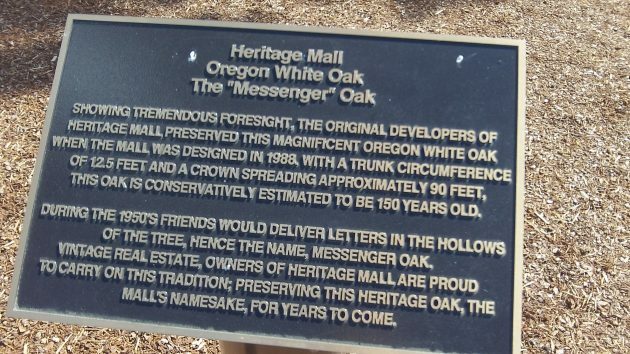 When I came out of Target in Albany the other day, I stopped to take a shot of the big white oak that has become a symbol of Heritage Mall. It reminded me once again to be skeptical of predictions of doom, for many turn out to be as unwarranted as the fears about this tree a decade ago. Then, in September 2005, an uproar developed after the mall hired someone to prune the venerable giant. A branch or two had come crashing down, and there were the usual safety concerns. The pruning cost the tree two large arms and changed its shape or appearance. Defenders of mature trees in town raised complaints. There were predictions by some, though soon contradicted by others, that the tree would probably die as a result of the loss of the branches that were pruned. Like all of us, even big trees eventually do die. 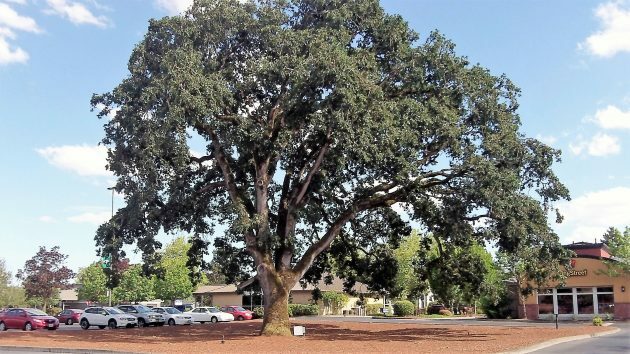 But almost a decade after the controversy, a story in the Democrat-Herald in 2014 reported the good news: The oak seemed to have developed no major “health issues” since the pruning was done. And when you look at it this summer, it still has the majesty of a big and vigorous oak, well worth the attention it gets. Until last week, I had not noticed the plaque telling the tree’s story. It mentions the legend that the tree was known as a “messenger oak” because in bygone days friends would leave written notes for each other in the hollows of the bark. I wonder how true that is. Seems like that kind of texting would have been an extremely unreliable way of getting in touch with someone you wanted to reach. How would the other party know a text was waiting? And what about privacy? Unless a code was employed, anyone could scour the tree and intercept whatever was there. I’m like you Hasso – hadn’t noticed the plaque. Do you know when and who placed it. It’s pretty clear the mall management placed it. But when, I don’t know.